Priced from Rp.248.5 million to Rp.262.45 million. 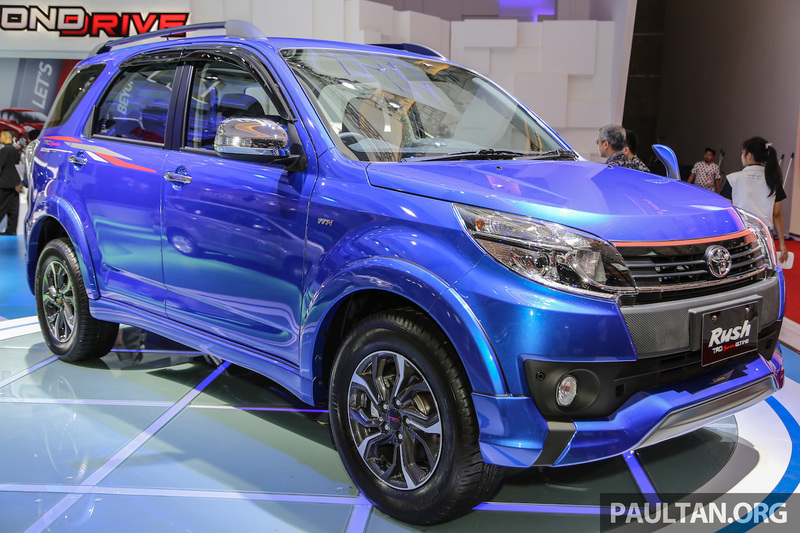 Toyota Indonesia is showcasing the facelifted 2016 Toyota Rush compact SUV in its top-end TRD Sportivo Ultimo grade at the IIMS 2016. It was launched in the Indonesian market on February 27 at prices starting from Rp.233 million to Rp.262.45 million. The facelifted Toyota Rush was launched in the Indonesian market on February 27. The TRD Sportivo grade features redesigned front bumper with a two-tone effect finish and a faux carbon-fibre finish under the grille, contrasting chrome and red lines running across the radiator grille that connect the two projector headlamps, foglamps and a dark silver skid plate. At the back, the taillamp clusters have been updated to feature a combination of LEDs and smoked lens. Also included are new 16-inch alloy wheels for the top-end Sportivo variant. Powering the facelifted Toyota Rush is the same 1.5 litre VVT-i petrol four-cylinder engine, which makes 109 PS at 6,000 rpm and 141 Nm at 4,400 rpm. It is available with a 5-speed manual or a 4-speed automatic.